Oil is a volatile commodity, prone to swift and material price swings. This is a fact of life for every company that operates in the oil patch. The best that a company like ExxonMobil Corporation (NYSE:XOM) can do is prepare for the worst. In fact, this integrated oil giant's conservative approach is one of the key reasons it is an attractive way to invest in the energy industry. Here's a big, $20 billion reason to buy Exxon. In 2012, ConocoPhillips (NYSE:COP) went all in on oil and natural gas production, jettisoning its refining assets in a spinoff of Phillips 66. The refining business tends to benefit from falling oil prices because oil is a key input. At that point, long-term debt made up around 30% of ConocoPhillips' capital structure. When oil prices started to crater in mid-2014, the company (which was now focused on drilling) saw its revenue plummet, and it started to bleed red ink. It pulled back on spending and added debt to support its remaining capital spending plans and dividend. In the end, however, it was forced to trim its dividend by 66% in 2016. Long-term debt peaked at $26.2 billion in 2016 (roughly 43% of the capital structure). A lack of diversification that left ConocoPhillips entirely reliant on oil and natural gas was the big driver of the company's dividend cut. But even companies that remain diversified, like Royal Dutch Shell PLC (NYSE:RDS-B), can have trouble dealing with volatile oil prices. Shell, with upstream and downstream operations, has chosen to make heavy use of long-term debt, a move that limits the flexibility it has to add additional debt to its balance sheet. At the end of 2014, Shell had $38 billion in long-term debt, roughly 18% of its capital structure. As it worked through the downturn, which included making a large opportunistic acquisition, long-term debt ballooned to $83 billion by the end of 2017, or roughly 30% of the capital structure. To be fair, Shell tends to keep a great deal of cash around to help soften the blow of oil downturns, and it quickly announced plans to sell assets to pay down debt. But that didn't stop the international oil giant from putting dividend increases on hold, keeping the dividend static since the first quarter of 2014. During the worst of the downturn, investors were worried that the dividend would end up being cut. That, by the way, is exactly what Italian energy giant Eni S.p.A (NYSE:E) did in 2015, trimming its payout by roughly 29%. Part of the issue was that long-term debt was roughly 24% of the capital structure heading into the oil downturn. That number peaked in the 40% range in 2016, as the oil major, like most peers, used leverage to support its business while oil prices and financial results were weak. The two themes above are diversification and debt. Too little of the first and/or too much of the second, and oil downturns are very worrisome affairs. To be fair, none of the above companies were at risk of going bankrupt because of falling oil prices. But it clearly affected their businesses and has resulted in investors getting hit with dividend cuts or long periods of static payments (the latter is clearly more preferable, but often precedes a dividend cut and leaves investors understandably on edge). Which is exactly why investors should take a long look at Exxon's rock-solid balance sheet. Heading into the oil downturn, Exxon's diversified business was carrying roughly $6.5 billion worth of debt. That was a tiny 4% of the capital structure. By the end of 2016, debt had ballooned to $27.7 billion, a massive increase but still only about 15% of the capital structure. That's less leverage than Shell, Eni, and ConocoPhillips had as they entered the downturn. Like its peers, Exxon used the debt to fund capital expenditures and support its dividend. That dividend, meanwhile, was increased each year through the downturn, despite the hit to revenue and earnings from low oil prices. The company's annual dividend-increase streak is up to an incredible 36 consecutive years. Despite the relatively lower use of debt, Exxon has been using the current oil rebound to reduce leverage. Long-term debt is down to around $20.7 billion, or roughly 10% of the capital structure. Put another way, it still has a huge amount of financial flexibility to add debt to its balance sheet to deal with commodity volatility while continuing to reward investors with annual dividend increases. You can argue that Chevron Corporation (NYSE:CVX) is similarly conservative, noting the oil giant's impressive record of annual dividend hikes (31 years and counting). Only the dividend was held at $1.07 a share for 10 consecutive quarters during the oil downturn -- that's two and a half years, and a long time for investors to worry about a potential dividend cut. The annual streak is only alive because of timing, since Chevron increases its dividend in the middle of the year. Debt was about 10% of the capital structure heading into 2014 and peaked at nearly 20% in 2016. The big difference is that Chevron's business, while diversified, is more heavily weighted toward the upstream side. Debt is down to around 16% of the capital structure at this point, but dividend investors should still think about the bigger picture before jumping aboard here. Oil and natural gas are highly cyclical commodities, which energy companies like Exxon, Shell, Eni, Chevron, and ConocoPhillips can't do anything about. What they can do is prepare for the ups and downs they know will arrive. The last downturn was a trying affair that highlighted the benefit of taking a conservative approach to the energy space. Exxon stood out on this front and still does. While the $20 billion in long-term debt it has on the balance sheet today is high compared with its pre-downturn levels, it remains modest versus its peers. 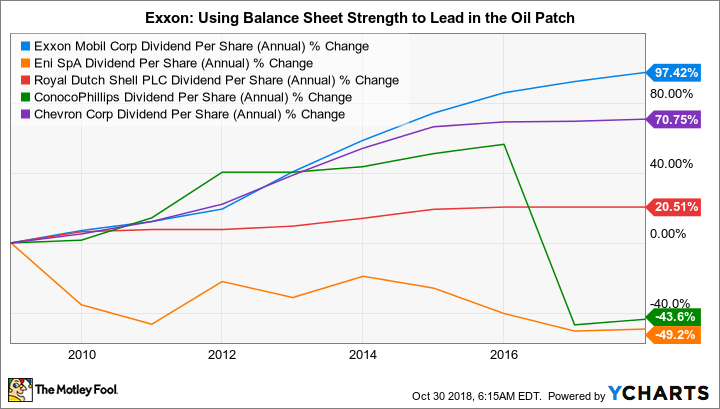 And it suggests that Exxon will be able to keep paying its dividend and investing in its business when the next downturn arrives. It has ensured that it has ample room for additional leverage on its balance sheet to handle the cyclical ups and downs of the oil industry.